Welcome to Standard Legal! Our mission is to help everyday people handle common legal issues on their own, and do it in a very affordable way. Standard Legal offers two ways for people to manage pro se legal issues. 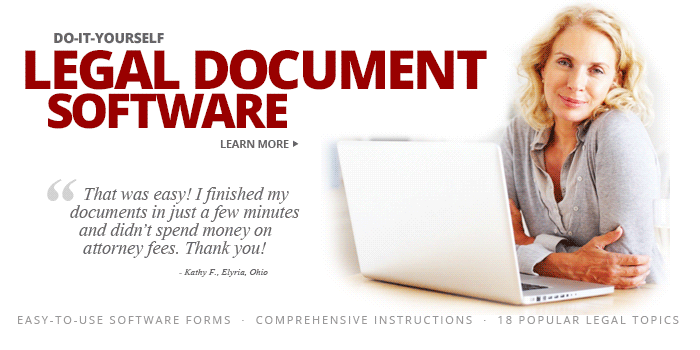 The most commonly chosen option is do-it-yourself legal forms software. Standard Legal's do-it-yourself legal forms software is simple to use, with many of the forms easily completed in just a few minutes! For people who aren't comfortable using the computer and want some help creating their documents, Standard Legal offers Legal Document Preparation Services. With 'doc prep', a professional document preparation specialist provides a questionnaire to you. You provide the answers to each question in reply, which you can do either by phone or email -- your choice! From those answers, Standard Legal creates the custom legal documents you need using the information you provide. The documents are sent back to you either by email or printed-and-mailed (again, your choice!). To complete the process, simply read, confirm and sign the documents you receive, then file or distribute them as directed. Finished! Our document preparation service is a very simple way to handle a basic legal matter, all without having to pay the high cost of attorney fees. FIND A LOCAL ATTORNEY -- FOR FREE! Of course, not every person's legal situation lends itself to self-help law. If you have a complex or uncommon legal matter, if you are caught up in a criminal issue, or if you are not sure you can manage any part of the legal process on your own, you should seek the advice of an attorney. But Standard Legal can help there, too: we offer a Local Attorney Find service that can help you choose a qualified local law firm for FREE! Click on any of the links below to learn more about Standard Legal. Have a question about the legal topics we cover? Check out a comprehensive series of questions and answers at Ask Standard Legal! We want to help you resolve your legal situations in an affordable and stress-free way! So thank you for taking the time to visit Standard Legal. Can't Find a Specific Legal Form?